Recruit Joe Bullock scored two tries as Wigan's fringe players and young-guns cruised to a 34-6 victory against London Skolars in the capital. They established a 16-0 lead by half-time and further tries by Callum Field, Morgan Smithies and Bullocks' second tightened their grip on the match. Wigan have met the Skolars in the annual Capital Challenge for the last few years. The game is staged at Honourable Artillery Company, in the heart of London's financial district, and former coach Shaun Wane - now with Scotland RU - was among the interested spectators. With Adrian Lam keeping many of his senior players back for Sunday's friendly at Salford, a team made up of youngsters and fringe players still proved too strong for the League One outfit. Wigan, coached by Under-19s boss Darrell Goulding, had to wait until the 20th minute to break the deadlock through a try from ex-Barrow prop Bullock, converted by French livewire Morgan Escare. But with forward Liam Byrne - who was promoted to the senior set-up this off-season - and utility Craig Mullen also going over, they established a 16-0 lead at the break and continued the trend during the second-half to give Lam plenty of food for thought. As well as Escare and fellow Frenchman Romain Navarrete, centre Chris Hankinson made his first appearance since suffering a detached retina in his second game since signing from Swinton. Samy Kibula, Oli Partington, Mullen, Jake Shorrocks, Liam Forsyth, James Worthington, Josh Ganson and Field have all had a taste of senior action at Wigan, with youngsters including Jake Sculthorpe - son of GB legend Paul - and England academy half Harry Smith completing the squad. 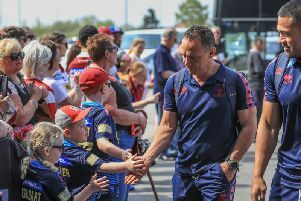 As well as Sunday's match at Salford, Wigan will also travel to Barrow next Saturday, with Lam expected to field a squad missing the line-up which will launch the new Super League season at St Helens the following Thursday.